One of the fascinating side effects of a fresh snowfall is the evening, the smoothing of the forest floor. All the bumps and hollows get covered by a fresh, smooth white blanket. The first walk in a fresh snow is like exploring a world untouched by anybody or anything – except for the very clear and frequent animal tracks you’re likely to find. Every game trail, previously unnoticed, is highlighted by fresh tracks in the snow, and if you know what to look for you can learn a lot about animal behaviors that normally might have gone unseen. Though FINDING animal tracks in the snow is relatively easy, identifying tracks in the snow isn’t as easy as it sounds. Depending on the firmness, moisture content, temperature, and depth of the snowfall, a given track may be clear and defined, or softened around the edges by melt, obscured by drift, or deformed by the animal who made it by plowing through deep powder and dragging its legs or body. Despite all that, if you’re observant, you’re bound to find tell-tale clear prints, and rather than the one or two you might find in a mud-bank along a stream in the summer, here you’ll see trails, intersections, and maybe even interactions – so it’s definitely worth a look! Here then, is a quick primer on some of the more common tracks you’re likely to find. Deer tracks are distinctive, at least in the part of the world I live in (mid-Atlantic), because they’re the only ones made by hooves! Whitetails generate a heart-shaped track with a split hoof that is rounded in the back, pointed in the front. In winter, these can be challenging to interpret, because especially in deep snow, deer tend to plant their back feet in the same holes made by their front, so their prints aren’t often clear. When the snow is deep enough for this, though, the drag marks in the snow made as they lift their feet clear and push the snow forward should help clarify direction of travel. Squirrels, like rabbits, are bounders. You may see them carefully “stepping” from time to time, but primarily they “hop”. This means that their rear feet plant outside, and depending on how fast they’re running, sometimes in front of, their front feet. Squirrel tracks most often lead from tree to tree, or other climbable object. They differ from rabbits (below), in two ways – first that their print patterns tend to be in a side-to-side grouping, sometimes with all four feet in a line. Second, if the surface is right, squirrels will show toes – five toes on the rear foot, and four toes on the front. Go out in the early morning after a snowfall and chances are one of the first sets of tracks you find will belong to a rabbit. These tracks tend to be plentiful, and easy to find. Rabbits, of course, hop – and their bounding pattern places their rear feet distinctly in front of their front feet, stretched out in a grouping that is elongated in the direction of travel. When they run, their front feet plant, their rear feet come up to the outside and stretch forward, then plant for a long jump, landing again on the front feet. Rabbit tracks do not tend to show toes. Their feet are generally furrier, and so the shape and the patterns are the things to look for here. Dog prints are plentiful, and they’re not always made by wildlife – though with today’s leash laws in many places, a dog’s prints without an accompanying human could be cause to suspect a wild cousin. Differentiating dog species from a print is really difficult, but size gives a lot of clues (a fox will not leave a track big enough to be confused with a lab or golden retriever!). 1) Four toes that usually (but not always) show a claw mark. 2) Heel pad has a single forward lobe, and two in the rear. 4) Print is symmetric left-to-right, with middle toes even. A dog print leaves a clear “X” mark, centered in front of the heel pad and with the limbs of the “X” extending between the toes. If you’re REALLY good, you can tell front from back – front prints are usually slightly larger, with a straight edge on the heel pad. Rear prints show a curve on the heel pad. (See drawing). Again, cats are everywhere, and in most places cats are free to roam (and predate on small wild animals). If you’re near human habitation, any cat tracks you see are likely going to be those of housecats, but even their larger cousins share these traits as compared to dogs. 1) Four toes that usually do NOT show claw marks. When running in soft terrain, cats DO sometimes use claws, so this isn’t a foolproof discriminator. 2) Heel pad has a double forward lobe, and three in the rear (though the third, middle, is often subtle). 3) Print is wider and shorter than the elongated oval proportion of a dog’s. 4) Print is NOT symmetric. A cat will show one of the middle toes slightly ahead of the other – this is analogous to your human middle finger. Tuck your thumbs up under your palms and look at the back of your hand, and you can see how this forward toe indicates whether you see a left or right print. Cat prints lack the “X” seen in dogs. Like dogs, cats show a more curved heel pad on the rear foot. Dinosaur prints are pretty clear – scaly all over, with three splayed toes in the front, and a shorter one in the back. I came across this path in the woods recently. A friend tried to tell me this is actually the print of a wild turkey and that the thin lines paralleling the tracks out to the sides are actually drag marks from wings of a male turkey (a “tom”) puffed up in a “showing” posture. I know better, though. 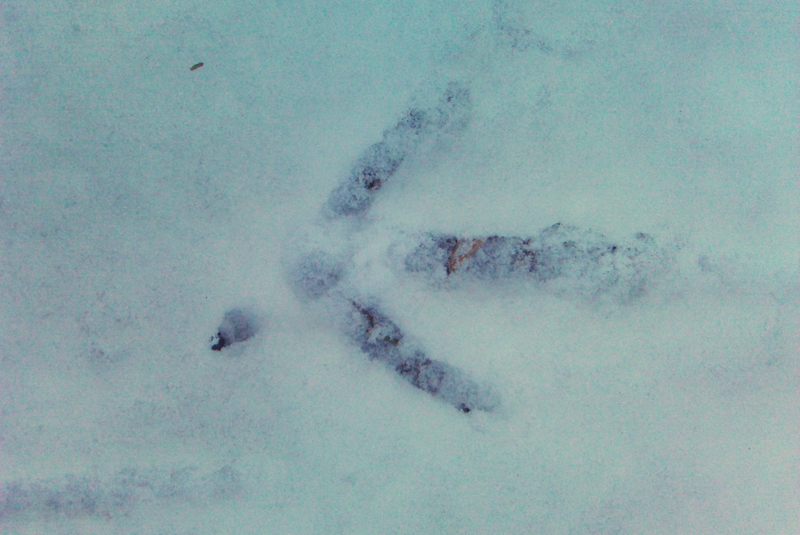 This is CLEARLY a dinosaur track, and I’m not really sure there’s any difference between that and a turkey anyway! There are other critters out there of course, groundhogs, opossums, skunks, raccoons, otter, muskrat… but perhaps looking at their prints is the subject for another time. In the meantime, I hope this helps you spot some of the more common and easy-to-identify prints, and gives you an excuse to go tracking next time we have some snow to highlight the movements of our wild neighboors. Good luck!